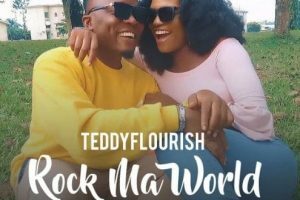 Multi-Talented Nigerian R&B-Afro Blend singer, TeddyFlourish comes through with a brand new scintillating song titled Rock Ma World, produced by Heros Records Music producer Mr Hero. It’s going to be an exciting weekend with a dose of the stash and stables of the perennial hitmaker, Teddyflourish as he continues to boss through the Nigerian music industry; especially across the genres of R&B-Afro Blend Music. Many will fondly remember the singers wave-making hit, “Stay With Me & Regular girl.” which dominated the trends and waves at the time of its release; earning him the praise and accolades of music lovers and fans across Africa. With all of the abundance of the smash hit records he made, just too numerous to mention, he recently kicked off the year 2019 in style with a new song series and movement and here is the first “Rock Ma World. Only thing is the fact that with the talent, craft, and artistry he controls on his vocals, Teddyflourish simply looks to inspire the groove and grind again with Rock Ma World” which sees to collaborate with other Top celebrities. This creation packs the heat with the structured beats, exciting, well-tightened instrumental and an overall production superb that makes for an absolute musical bliss as powered by Heros Records Producer Mr Hero. You better get right into the mood as Rock Ma World will inspire you to an explosive and lovely weekend as you watch the colorful visuals. Simply download, then share your thoughts and opinion in the comments section below. Smooth vibes,dope visuals. Well put together.